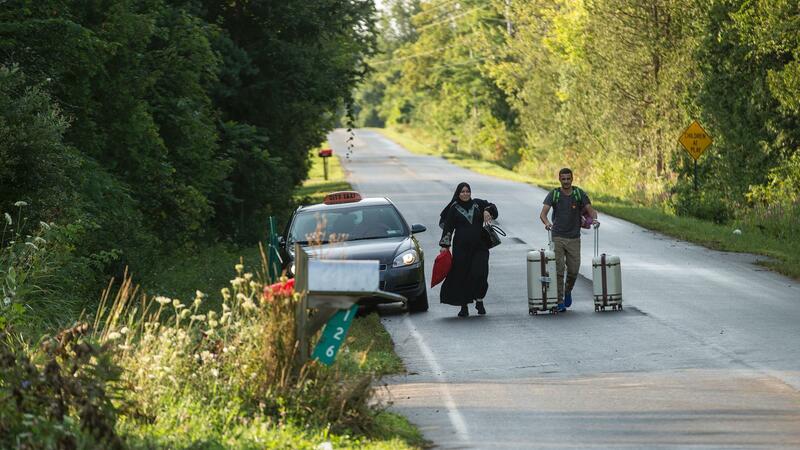 A cab drops off a couple of asylum seekers at the U.S.-Canada border near Champlain, N.Y., on Aug. 20. Mike Tippett is telling companies worried about U.S. immigration policy to move to Vancouver. Ray Walia co-founded Launch Academy and works with the Canadian government to help attract tech companies to Canada. He says even American companies are interested. Mona Hassennia says some clients feel invited to illegally come to Canada. When Donald Trump took office, American tech companies worried that getting international employees work visas in the U.S. would get a lot harder. But Tippett had a solution to offer them: move to Vancouver. Vancouver's tech industry has been growing for years now, with companies like Amazon, Slack, Microsoft and SAP all with large headquarters there. It's a quick flight from San Francisco, and a two-hour drive from Seattle. It's in the same time zone with the same language. Labor is also cheaper. Tippett predicted there would be a surge of tech workers looking for an alternative to America. 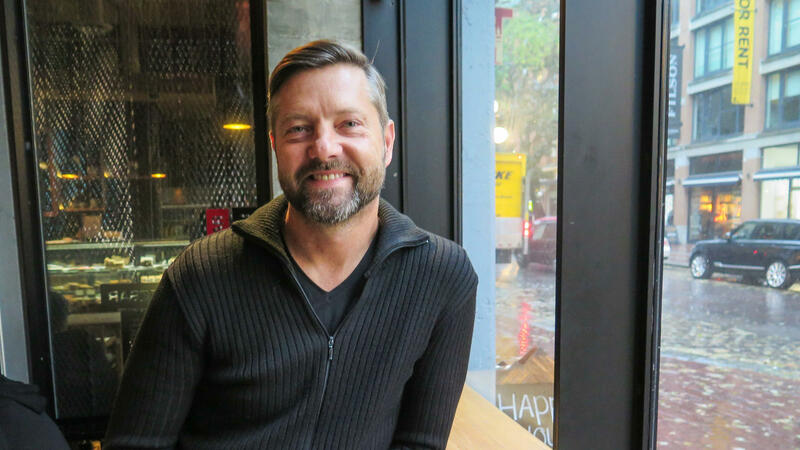 He founded the company True North, which helps tech workers move to Canada, get incorporated, deal with all the tax and other legal and immigration issues. "We say, come on up! It's a great opportunity for Vancouver and Canada generally," he says, laughing. Tippett says Silicon Valley is still the place to be. But each high-skilled worker who moves to Canada is America's loss. "America used to be this place where you could go and have some assurances that you could live the American dream, you can be successful, you're not going to get kicked out, and it was a safe place to be," he says. "I think that notion has been largely shattered. Whereas Canada has gone the other direction and said, 'We are that place, and you can come here; you're not gonna kicked out.' "
Alex Modon heard that message. Two team members at his small Silicon Valley start-up are from India. They were in the U.S. on tourist visas initially, but Modon hired a lawyer to get them U.S. work visas. The months dragged on and the bills racked up. After spending tens of thousands of dollars, his Indian co-workers didn't get permission to stay in the country. The H1B visas that Modon's team applied for have always been restricted. Only a limited number are handed out each year. And Modon says he never thought it was going to get any easier under the Trump administration. So his team hired True North to help his co-founders move to Vancouver — they got work permits in a matter of weeks. "We're probably a pretty good example of folks that will end up building a piece of our company and in another country. Not because that's the first choice, but because that's the necessary choice," Modon says. Canada is now aggressively marketing itself as an alternative to Silicon Valley. This past summer, the Canadian government launched a program that streamlines the immigration process for tech workers. 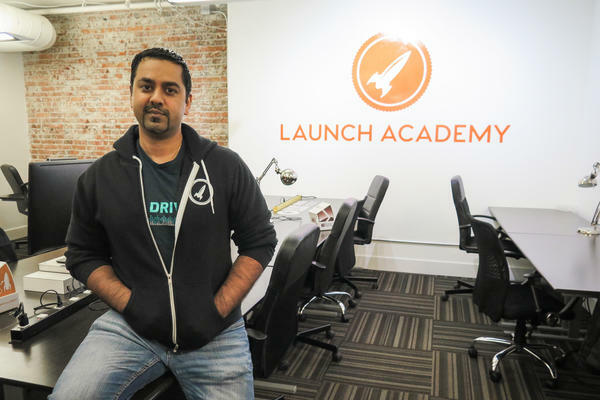 At a start-up incubator in Vancouver called Launch Academy, young people in hoodies are hunched over their laptops. Launch Academy co-founder Ray Walia is showing us around. He works with the Canadian government on a start-up visa program meant to target and vet budding companies from around the world. Visas can be obtained within two to four weeks after approval. Walia recently went to India to sell Canada as a place to come and build a company. He says he's seen a lot of interest — even from the U.S. He estimates that 30-40 percent of the companies who've applied for the start-up visa are American. Migrants can't "just show up"
But it's not just highly skilled workers who are taking Canada at its word that it's friendly to immigrants. The message has had some unintended consequences. This year, more than 15,000 people have illegally crossed the border from the U.S. to Canada. International Social Service is a nonprofit that helps immigrants and refugees settle in Canada. Mona Hassennia is one of the center's directors. She says 80 percent of her clients have walked over the border from the United States into Canada. "I think the biggest reason that they're coming is the safety issue. They don't feel that there is safety in the United States, she says. She recounts the story of one of her clients who told her that they came to Vancouver because they were invited. "And we're kind of all looking at each other like, who invited you? And she said, 'Well, the prime minister of Canada,' " says Hassennia. After President Trump launched his travel ban, Prime Minister Justin Trudeau made a point of accepting a number of Syrian refugees, and tweeting "#WelcomeToCanada." Hassennia says many refugees in the United States have taken up the implicit offer. Ahmed Hussen is Canada's Minister of immigration, refugees and citizenship, who was a refugee himself. He came to Canada from Somalia as a teenager. He says the government is trying to counter the impression that Canada has an open border. "If you are just coming because you want a better life and a better opportunity, then you have to apply," he says. Just crossing the border is "illegal and potentially dangerous." "There is a lot of misinformation to certain communities in the United States who were given the wrong impression about Canada," Hussen says. The government is trying to "correct the record" with diaspora communities in American cities. "Look, you are welcome to Canada," he says, "but it doesn't mean you can just show up because of your perception of what Canada is about." Illegal crossings were down in September. But the influx of people fleeing America has still provoked a backlash in Canada. A recent poll found that just over half of Canadians think their government is being "too generous" to asylum seekers. It just got more complicated for people from other countries to stay and work in the United States. This past week, the Trump administration announced that immigrant workers with H-1B visas will no longer be able to get them renewed without a full re-evaluation of their case. That's often a lengthy, involved and expensive process. These are coveted visas for highly skilled people. It's one of the many significant changes President Trump has made to the U.S. immigration system, that includes his travel ban which has been fiercely disputed in court since it was announced in January. The president says he's working to put America and Americans first. But his immigration policies have had serious implications for Canada, as we found out on a trip to our northern border. Right after the U.S. election, Mike Tippett had an idea. TIPPETT: ...Many of the startups and technology companies in the States and, indeed, across the globe are made up of people who are not necessarily from that country. GARCIA-NAVARRO: About half of all American startups were founded by immigrants. And when Donald Trump took office, American tech companies worried that getting international employees work visas in the U.S. would get a lot harder. But Tippett had a solution to offer them - move to Vancouver. And Vancouver's tech industry has been growing for years now. Big companies have big operations in the city. GARCIA-NAVARRO: Vancouver's appeal? - it's a quick flight from San Francisco and a two-hour drive from Seattle, same time zone, same language. Labor's cheaper. Tippett predicted there would be a surge of tech workers looking for an alternative to America. And so he founded his company True North. TIPPETT: And what we do is we help them come up here, get incorporated, deal with all the tax and other legal issues, immigration issues and then move up whoever wants to come up here. We say, come on up (laughter). We think it's a great opportunity for Vancouver and, I think, Canada, generally. GARCIA-NAVARRO: Tippett says Silicon Valley is still the place to be. But each highly skilled worker that moves to Canada is America's loss. TIPPETT: America used to be this place where you could go and have some assurances that, you know, you could live the American dream. You could be successful. You're not going to get kicked out. And that was a safe place to be. And I think that notion has been largely shattered. Whereas Canada has gone the other direction and said, you know, we are that place. And you can come here, and you're not going to get kicked out. GARCIA-NAVARRO: Alex Modon heard that message. He has a small startup in Silicon Valley. ALEX MODON: And a couple of our members of our core founding team are from India. We originally had them over here in the States with tourist visas working together, formulating the beginning thoughts of our idea and our company and really starting to get off the ground. GARCIA-NAVARRO: So Modon hired a lawyer to get them work visas in the U.S. But the months dragged on, and the bills racked up. MODON: We've spent tens of thousands of dollars doing it. At this point, we've certainly lost count as to what that specific dollar amount is. But it's a sizable chunk as you're at a startup, right? And like those - that money's super important because that's like head count for another person. GARCIA-NAVARRO: But even after all that, his Indian coworkers didn't get permission to stay in America. Now, it's important to clarify that the H-1B visas that Modon's team was applying for have always been restricted. Only a limited number are handed out each year. But Modon says he didn't think it was going to get any easier under the Trump administration. So his team hired True North to help his co-founders move to Vancouver where they got work permits in a matter of weeks. MODON: We're probably a pretty good example of folks who will end up building a piece for our company in another country, not because that's the first choice but because that's the necessary choice. GARCIA-NAVARRO: Canada is now aggressively marketing itself as an alternative to Silicon Valley. This summer, it launched a program that fast-tracks the immigration process for tech workers. But it's not just highly skilled workers who are taking Canada at its word that it is friendly to immigrants. The message has had some unintended consequences. UNIDENTIFIED MAN #1: Canadian Prime Minister Justin Trudeau has a message for refugees rejected by Donald Trump - Canada welcomes you. UNIDENTIFIED WOMAN: Hashtag #WelcomeToCanada has been trending. GARCIA-NAVARRO: Already this year, more than 15,000 people have illegally crossed the border from the United States to Canada. 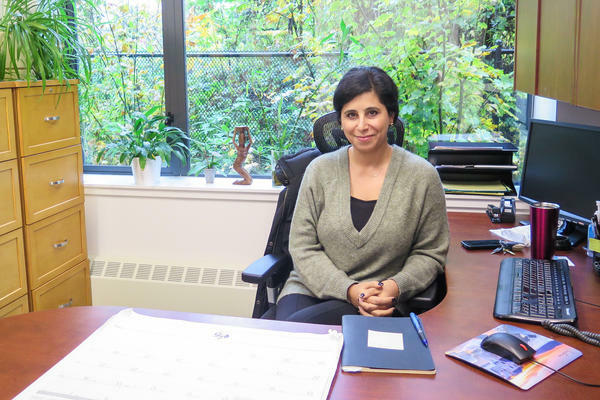 At the Immigrant Services Society of British Columbia, a translator helps a newly arrived Iranian couple set up a bank account. UNIDENTIFIED TRANSLATOR: He's going to have his own, and she's going to have her own. And they can't share. They can't share. GARCIA-NAVARRO: ISS is a nonprofit that helps immigrants and refugees settle in Canada. Mona Hassennia is one of the center's directors. MONA HASSENNIA: I would say around 80 percent, maybe over that, of our clients are actually walking through the U.S. border. So they're coming into Canada having come through the U.S. usually on a visitor's visa with no intention of wanting to stay in the U.S.
GARCIA-NAVARRO: Why are they tell you that they're doing that? GARCIA-NAVARRO: ...They're personally invited by Prime Minister Trudeau. AHMED HUSSEN: The prime minister was welcoming those who are seeking protection and who are genuine refugees. GARCIA-NAVARRO: Ahmed Hussen is Canada's Minister of Immigration, Refugees and Citizenship. Hussen himself was a refugee. He came to Canada from Somalia as a teenager. He says they're now trying to counter the impression that Canada has an open border. HUSSEN: If you are just coming because you want a better life and a better opportunity, then you have to apply and regulate economic immigration program and not try to cross the border. We've told people that that's not the way to go. It's illegal. It's potentially dangerous. GARCIA-NAVARRO: Have you had to sort of backpedal that message a little bit to make it clear that the border is not just open for anyone who wants to come into Canada? HUSSEN: It's not a question of backpedaling. There is a lot of misinformation to certain communities in the United States who are given the wrong impression about Canada. To correct that misinformation, we've been deploying resources from our consulates in various American cities to to correct the record with some of the diaspora communities saying, look. You're welcome to Canada, but you have to - it doesn't mean that you can just show up because of your perception of what Canada is about. GARCIA-NAVARRO: The Trump administration's travel ban has run into a series of legal challenges. But the perception that America is closing its door to immigrants remains. Canada is trying to capitalize on that, but it's struggling to figure out what the hashtag #WelcomeToCanada actually means. They're wooing highly skilled immigrants while dissuading refugees from coming north. Illegal crossings were down in September. The influx, though, has provoked a backlash in Canada. A recent poll found that just over half of Canadians think their government is being too generous to asylum-seekers.